'Helmet, Crash, Lightweight'. Stores reference 22c/943, size 7. These were initially developed as a protective helmet for the RAF but later issued to British Army AIr Corps glider pilots who famously wore them during Operation Overlord, the D-day invasion. The helmet has a rigid crown made from moulded fibre. This has a webbing liner and the lower part of the helmet is made utilising a C-type flying helmet with externally stitched receiver carriers and an elasticated webbing chinstrap. 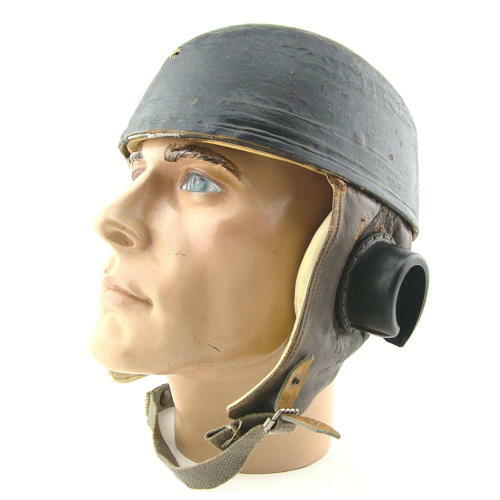 The helmet could have press stud fastenings added to accept an oxygen mask but in practice this helmet would have been used as a 'microphone carrier' and many were used with a wiring loom and 'dangling' hand-held microphone instead. The rigid section is in good condition. It has surface crazing and minor chipping but no serious issues. The C-type section is good. The leather remains supple but the rear seams have split and there is rubbing and wear around the upper edge. It is War department broad arrow stamped with reference and size details. Both receiver carriers remain in excellent pliable condition. Internally the webbing liner is very good and the chamois remains very clean. The chinstrap is rather stretched and lacks elasticity and the female part of the attachment stud is absent (we can replace if required). A good '+' used example of an extremely rare helmet. Stock code GPH-NIV.